If you’ve ever wondered how to make taco soup, have I got the recipe for you! 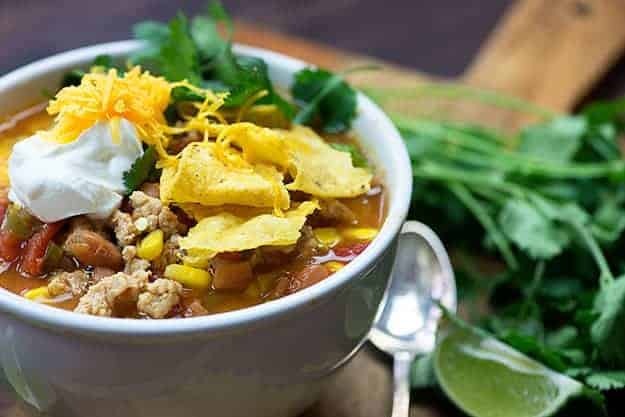 This is an easy taco soup recipe and my kids absolutely loved it. Everyone went back for seconds. Friends, I have a little bit of news. It’s not news. Y’all probably already know this about me. I am obsessed with tacos. 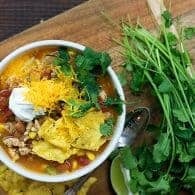 This week I meal prepped a big batch of this easy taco soup for lunches and a big batch of my slow cooker chicken tacos for quick dinners on the nights we were busy. I basically ate some form of taco every single day this week and you know what? I only regret that I didn’t think to make scrambled egg tacos for breakfast each morning to really bring the week home. My husband has a tendency to get a little sick of Mexican food, especially if we’re eating out. He’s a bit picky and ethnic food can be a challenge for him. Luckily, he loves my taco casserole, taco chili, and fried tacos. It’s not like we have a shortage of tacos around here. I guess I’ll keep the man. 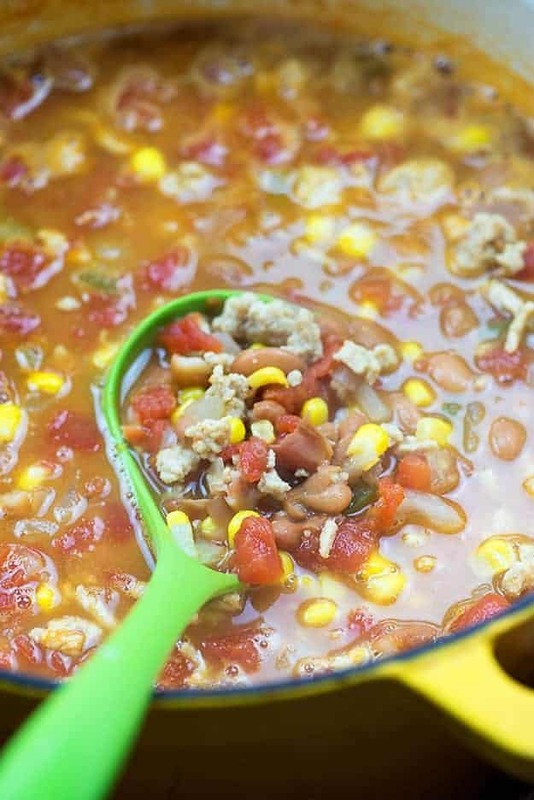 We all ate this easy taco soup and went back for seconds! So, I have been sharing low carb recipes on here off and on for the last year or two and they always go over so well! You guys really seem to love them. 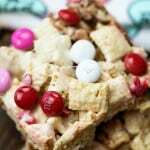 Curious what y’all would think about a sprinkling of Weight Watchers recipes mixed in? So, this is actually Weight Watchers taco soup. And, y’all, it’s zero points on the new Freestyle plan. Like, I said, I meal prepped this and then I had it for lunch all week. It was perfect to have a zero point lunch (two points for me, since I added a little bit of corn chips to the top for crunch), because then I didn’t have to feel bad about using my favorite coffee creamer in my coffee every morning and I had more than enough points for dinner each night. 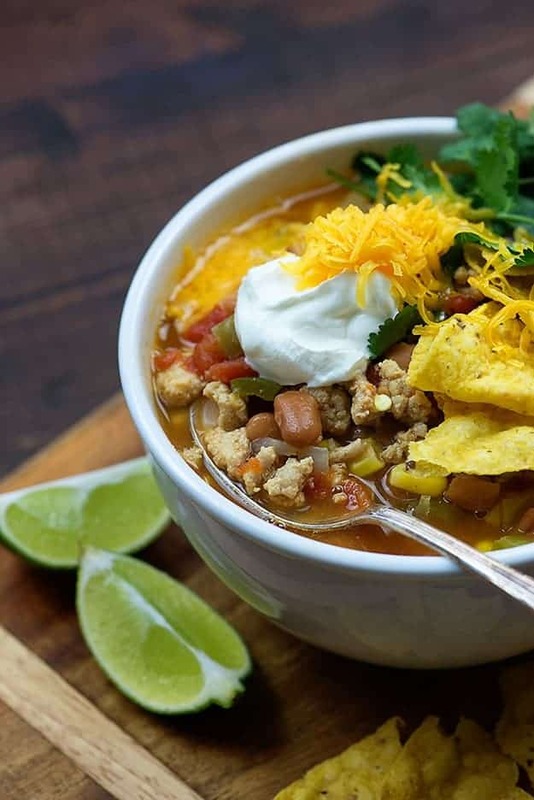 And this easy taco soup is ready in no time. I mean, you just brown some lean ground chicken (or turkey! ), stir in some chopped veggies, a couple cans of beans, and some frozen corn, and then let things simmer. Try my turkey meatloaf for another lightened up recipe! I topped my bowl of soup with some fat free grated cheddar, a dollop of 0% Greek yogurt, a little cilantro, a squeeze of lime, and just a couple of corn chips. The chips add a great crunch, the lime and cilantro brightens the soup up, and the cheese and yogurt make things creamy and decadent tasting. And, as always, if you make this recipe, please snap a photo and tag me on Instagram at @bunsinmyoven or #bunsinmyoven! I love seeing what you guys are up to! 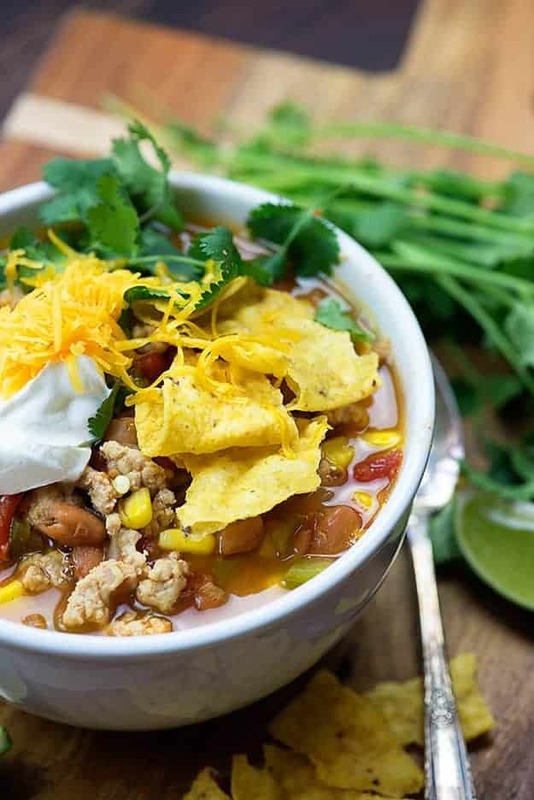 This easy taco soup recipe is a light and healthy favorite in our house! It's packed with chicken, veggies, and taco flavors and is ready in about 40 minutes. Add the chicken to a 5 quart pot over medium heat and brown, crumbling as it cooks. While the chicken cooks, dice the onions and bell peppers. When chicken is nearly cooked through, stir in the onions and peppers and continue cooking to soften, about 5 minutes. Add in the tomatoes, pinto beans, corn, taco seasoning, and broth. Stir well. Bring to a boil, reduce to a simmer, and cook for 20 minutes. 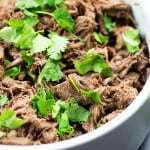 To serve, ladle soup into bowls and top with corn chips, grated cheese, cilantro, sour cream, and a squirt of fresh lime juice, as desired. 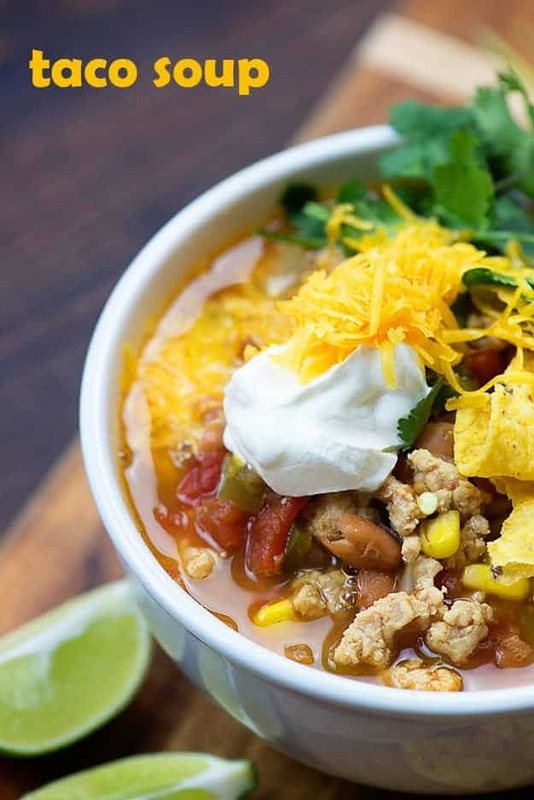 This Chicken Taco Soup is ZERO Weight Watchers Points on their new Freestyle plan, using 99% lean ground chicken but that does not include toppings. Yeah! What a great recipe. I love the W/W plan. It’s so easy and it works. Thanks for sharing – must try! HI! Just wanted to let ya know I spotted a typo after the 3rd picture. Think ya meant to say sprinkling and you have sprinking. Also, just a little helpful hint, if you add your taco seasoning in when you are browning the ground chicken you’ll get a lot more flavor in both the meat and the soup. Give it a try, you’ll really notice a difference! Love your recipes, keep em coming! Thanks for letting me know about the typo! This is awesome news! I have always loved your recipes. 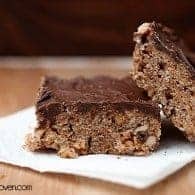 I started WW this month as well , so this recipe is so appreciated and exciting! Looking forward to see what other WW recipes you come up with! 🙂 Can’t wait to try this soup. This looks amazing! 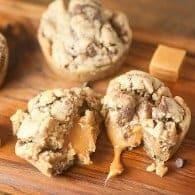 And yes please share some weight watchers recipes…I’m doing WW too and would love to have more recipe ideas from one of my fav food bloggers! Yay! Glad to hear you’re interested. And good luck with WW. I’m really loving it – hope you are too! Beautiful land hearty soup, exactly what i was looking for on a cold winter day. Tacos are life ? You are not alone in your obsession! I even got a coffee mug for Christmas that says ‘I don’t want feelings, I want tacos’. This recipe looks awesome, I’m going to have to try it later this week. Weight Watchers is a no-go for me, and for many type 2 diabetics, who do extremely well on low carb food. The taco soup, for example, has 30 net grams of carbs – that’s what I shoot for in a day. In 6 months of eating low carb and not starving myself, I dropped 41#, and got my blood glucose and A1C down out of the diabetic range. Another advantage, with a low carb way of eating, you can have fats – butter, cheese (not low fat! ), bacon – fat is what makes the diet tasty, and it works! Weight Watchers is not at all effective for me. Thanks, Karly – I do love your low-carb recipes! I will just ignore (or tinker with) the WW recipes. This soup is definitely down my alley. I love taco-flavored soups, especially ones that are as quick to throw together as this! I’ve never tried ground chicken–only ground turkey. Though I’ll for sure have to make a trip to the store to buy some so that I can make this for dinner tomorrow night. This looks amazing, I am really craving tacos right now! Believe it or not Karly I was thinking of your link party today thinking I should check if it’s back, and then you left a comment on my blog! Today! You must have known I was thinking of you:) So when is What’s Cookin’ Wednesday coming back? This looks lovely! I love your photography. Just wondering where you got the 0 point factor and if weight watchers have a copy of the recipe? I’m trying to record my serving in the app and can’t seem to find it anywhere. Any help is appreciated. Bring on the weight watchers recipes! I love your idea of plopping a dollop of a fat free greek yogurt on top of this taco soup. It sounds fantastic! Cheers to bunsinmyoven and to this bowl full of yumminess. Happy feasting. I made a small batch of this taco soup, and it was mouthwatering. I did not change a thing. My hubby loved it. Noticed I am talking , ‘in the past’ well that’s because it’s all eaten up. Haha! That’s great to hear, Ivory! for the recipe and keep up the good work. HOLY YUM! SIGN ME UP FOR THIS IT LOOKS DELICIOUS! We only have like two more weeks in AZ where hot food is acceptable I need to make this pronto! Loved It!!! I am so glad you created the recipe for Chicken. I made it in my Pressure Cooker and it warmed for 3 hours before we ate. The seasoning was Great!! !